The Klein Matterhorn (sometimes translated as Little Matterhorn) is a peak of the Pennine Alps, overlooking Zermatt in the Swiss canton of Valais. At 3,883 metres (12,740 ft) above sea level, it is the highest place in Europe that can be reached by aerial tramway, as well as by any other means of transport. The Klein Matterhorn is part of the Breithorn massif and overlooks on its south side the almost equally high flat glacier named Breithorn Plateau, just north of the international border with Italy. The name "Klein Matterhorn" is a reference to its much larger neighbour, the Matterhorn, which lies 7 km (4.3 mi) away across the Theodul Pass. A mountain is a large landform that rises above the surrounding land in a limited area, usually in the form of a peak. A mountain is generally steeper than a hill. Mountains are formed through tectonic forces or volcanism. These forces can locally raise the surface of the earth. Mountains erode slowly through the action of rivers, weather conditions, and glaciers. A few mountains are isolated summits, but most occur in huge mountain ranges. The Pennine Alps, also known as the Valais Alps, are a mountain range in the western part of the Alps. They are located in Switzerland (Valais) and Italy. Zermatt is a municipality in the district of Visp in the German-speaking section of the canton of Valais in Switzerland. It has a population of about 5,800 inhabitants and is classified as a town by the Swiss Federal Statistical Office (FSO). The Klein Matterhorn, with the adjacent ski-lifts to the slightly higher Gobba di Rollin, is also a year-round ski area, marketed as "Matterhorn Glacier Paradise", and part of the international ski area between Zermatt and Breuil-Cervinia. Gobba di Rollin is a mountain of the Pennine Alps, straddling the border between Switzerland and Italy. It is located south of the Breithorn and it is largely covered by ice, the summit area being particularly flat. On the north side is the Breithorn Plateau of the Theodul Glacier, on the east side is the Verraz Glacier and on the south is the Glacier d'Aventine. Breuil-Cervinia is an alpine resort in the Aosta Valley region of northwest Italy. It is a frazione of the comune of Valtournenche. Fast ascends to a height above 3,000 metres (9,800 ft) will frequently lead to headaches or other symptoms of altitude sickness with sensitive persons. Headache is the symptom of pain anywhere in the region of the head or neck. It occurs in migraines, tension-type headaches, and cluster headaches. Frequent headaches can affect relationships and employment. There is also an increased risk of depression in those with severe headaches. Altitude sickness, the mildest form being acute mountain sickness (AMS), is the negative health effect of high altitude, caused by rapid exposure to low amounts of oxygen at high elevation. Symptoms may include headaches, vomiting, tiredness, trouble sleeping, and dizziness. Acute mountain sickness can progress to high altitude pulmonary edema (HAPE) with associated shortness of breath or high altitude cerebral edema (HACE) with associated confusion. Chronic mountain sickness may occur after long term exposure to high altitude. Even before the construction license application was filed, the building promoter had to negotiate with the Swiss Alpine Club and with the Swiss Nature Conservation Society. These discussions resulted in two large natural reserve zones (the "Matterhorn" region and the "Monte Rosa" region). The third area (the "Schwarzsee-Theodul Glacier-Klein Matterhorn" region) was designated as a tourist zone. The Swiss Alpine Club is the largest mountaineering club in Switzerland. It was founded in 1863 in Olten and it is now composed of 111 sections with 110,000 members (2006). These include the Association of British Members of the Swiss Alpine Club. The Schwarzsee is a small lake near Zermatt in the canton of Valais, Switzerland. It is located below the Matterhorn next to the mountain ridge and to the cable car station of the same name at an elevation of 2,552 m (8,373 ft). Licensing was further delayed until 1969 by the citizens of Zermatt filing a complaint to the governing council of the Canton of Valais. In December 1970, the Swiss government finally gave permission for the cable way, but progress was further delayed until 1973 by objections from environmentalists. Eventually, on 17 December 1973, the Federal Council rejected objections and granted a construction license. The next major obstacle proved to be the recruitment of a work force to build the lift system. At altitudes of 3,000 to 4,000 m (9,843 to 13,123 ft) above sea level, worker productivity would be reduced by up to 50% compared to normal levels, and workers would be required to live for weeks on end within the camps. The construction of this cable car started in August 1976 at all three construction sites: the valley terminal, the three tower sites and the mountain terminal. Creation of the mountain terminal was a difficult undertaking. Some two thousand cubic metres (2,600 cu yd) of concrete were used in the mountain station, all of which had to be transported there by helicopter in specially insulated tanks, mixed with warm water and 2% anti-freeze. Weather conditions at the work site (3,820 metres or 12,530 feet above sea level) in high mountain terrain were extreme: temperatures falling to −40 °C (−40 °F), snowfalls, and high winds of over 100 km/h (62 mph). In the summer of 1977 the track, hand and counter cables totalling 35.8 kilometers (22.2 mi) in length and weighing to 300 tonnes (295 long tons; 331 short tons) were dragged from Schweigmatten to Trockener Steg, a massive undertaking in itself. It took several weeks to cover the distance of 3,600 metres (11,811 feet), with a vertical altitude of almost 1,000 metres or 3,281 feet and to rewind the cables on their reels. On December 1978, all four track cables were installed, and all remaining operations were completed by the spring of 1979. In the fall of 1979, the two 100 passenger cabins were flown from the village of Täsch to the valley terminal, attached to the hanger frames with the carriages lifted onto the track cables, with operations starting on 23 December, the start of the winter season. The Cable car was built by Von Roll LTD Bern Switzerland. The Klein Matterhorn is at the end of a multi-stage cable car journey from Zermatt, via Furi and Trockener Steg. The last station lies at a height of 3,820 metres (12,530 ft), on the north side of the peak. A tunnel connects it with the Breithorn Plateau on the south side. There is also a panoramic view platform on the top which can be reached by elevator—located midway through the tunnel—followed by a 10 m (33 ft) climb up stairs. The Ice Cave ("Glacier Grotto") is just outside the southern entrance with a view into the glacier below. As of 2005, over 14 million passengers had visited since completion, an average of 560,000 per year. The carriages were refurbished in 2005. Trockener Steg is a minor prominence in the area between the Matterhorn and the Breithorn, south of Zermatt in the canton of Valais. It lies at a height of 2,939 metres above sea level, near the front of the Upper Theodul Glacier. The station is a high-alpine environment, and in the thin air one must use caution when making any physical effort. If possible, take time to acclimatise on the way to the Klein Matterhorn. There are plenty of warnings about this on the way up. The lift serves the largest and highest summer-ski area in Europe. During summer months one can find many professional, as well as beginner, skiers here. Access to the ski slopes is via a tunnel blasted straight through the mountain. The Klein Matterhorn is a starting point to several 4,000-metre (13,123 ft) summits that can be reached within a few hours. These include the Breithorn and its subsidiary peaks, Pollux and Castor. It was announced in July 2006 the winning design for this construction was to consist of a pyramid of glass, with an observation platform at 4,000 meters with sky lifts on the outer wall to whisk passengers to the "new summit". Zermatt Mountain Cableways seem intent on marketing the construction as "the newest 4,000+ meter peak in the Alps". The Alpine region of Switzerland, conventionally referred to as the Swiss Alps, represents a major natural feature of the country and is, along with the Swiss Plateau and the Swiss portion of the Jura Mountains, one of its three main physiographic regions. The Swiss Alps extend over both the Western Alps and the Eastern Alps, encompassing an area sometimes called Central Alps. While the northern ranges from the Bernese Alps to the Appenzell Alps are entirely in Switzerland, the southern ranges from the Mont Blanc massif to the Bernina massif are shared with other countries such as France, Italy, Austria and Liechtenstein. The canton of Valais is one of the 26 cantons of Switzerland, situated in the southwestern part of the country, around the valley of the Rhône from its headwaters to Lake Geneva, separating the Pennine Alps from the Bernese Alps. The canton is simultaneously one of the driest regions of Switzerland in its central Rhône valley and among the wettest, having large amounts of snow and rain up on the highest peaks found in Switzerland. The canton of Valais is widely known for the Matterhorn and resort towns such as Crans-Montana, Saas Fee, Verbier and Zermatt. It is composed of 13 districts and its capital is Sion. The Matterhorn is a mountain of the Alps, straddling the main watershed and border between Switzerland and Italy. It is a large, near-symmetrical pyramidal peak in the extended Monte Rosa area of the Pennine Alps, whose summit is 4,478 metres (14,692 ft) high, making it one of the highest summits in the Alps and Europe. The four steep faces, rising above the surrounding glaciers, face the four compass points and are split by the Hörnli, Furggen, Leone/Lion, and Zmutt ridges. The mountain overlooks the Swiss town of Zermatt, in the canton of Valais, to the north-east and the Italian town of Breuil-Cervinia in the Aosta Valley to the south. Just east of the Matterhorn is Theodul Pass, the main passage between the two valleys on its north and south sides, and a trade route since the Roman Era. The Haute Route, is the name given to a route undertaken on foot or by ski touring between Chamonix in France and Zermatt in Switzerland. The Breithorn is a mountain range of the Pennine Alps with its highest peak of the same name, located on the border between Switzerland and Italy. It lies on the main chain of the Alps, approximately halfway between the Matterhorn and Monte Rosa and east of the Theodul Pass. Most of the massif is glaciated and includes several subsidiary peaks, all located east of the main summit: the Central Breithorn, the western Breithorn Twin, the Gendarm and the Roccia Nera. The main summit is sometimes distinguished by the name Western Breithorn. The nearest settlements are Zermatt (Valais) and St-Jacques. The Glacier Express (GEX) is an express train connecting railway stations of the two major mountain resorts of Zermatt and St. Moritz in the center of the Swiss Alps. The train is not an "express" in the sense of being a high-speed train, but rather, in the sense that it provides a one-seat ride for an eight-hours-long journey, and omits stops made by local trains. The Glacier Express is known as the slowest express train in the world. As St. Moritz and Zermatt are home to two well-known mountains, the Glacier Express is also said to travel from Matterhorn to Piz Bernina. Monte Rosa is a mountain massif located in the eastern part of the Pennine Alps. It is located between Italy and Switzerland (Valais). Monte Rosa is the second highest mountain in the Alps and western Europe, after Mont Blanc. The Gornergrat Railway is a mountain rack railway, located in the Swiss canton of Valais. It links the resort village of Zermatt, situated at 1,604 m (5,262 ft) above mean sea level, to the summit of the Gornergrat. The Gornergrat railway station is situated at an altitude of 3,089 m (10,135 ft), which makes the Gornergrat Railway the second highest railway in Europe after the Jungfrau, and the highest open-air railway of the continent. The line opened in 1898, and was the first electric rack railway to be built in Switzerland. The Gornergrat is a rocky ridge of the Pennine Alps, overlooking the Gorner Glacier south-east of Zermatt in Switzerland. It can be reached from Zermatt by the Gornergrat rack railway (GGB), the highest open-air railway in Europe. Between the Gornergrat railway station and the summit is the Kulm Hotel hosting the new Project "Stellarium Gornergrat" and until 2010 the Kölner Observatorium für SubMillimeter Astronomie KOSMA and before that the Gornergrat Infrared Telescope. The Theodulhorn is a mountain of the Pennine Alps, overlooking the Theodul Pass on the border between Switzerland and Italy. It lies south of Zermatt and east of Breuil-Cervinia. The northern side of the mountain is heavily glaciated and is part of a ski area. Theodul Pass, elevation 3,295 metres (10,810 ft), is a high mountain pass across the eastern Pennine Alps, connecting Zermatt in the Swiss canton of Valais and Breuil-Cervinia in the Italian region of Aosta Valley. Theodul Pass is the second lowest pass and the easiest pass between the valleys of Zermatt and Valtournanche. Zermatt railway station is a metre gauge railway station serving the car-free mountaineering and ski resort of Zermatt, in the Canton of Valais, Switzerland. It is the southern terminus of the BVZ Zermatt-Bahn (BVZ), which connects Zermatt with standard gauge lines at Visp and Brig. Since 1 January 2003, the BVZ has been owned and operated by the Matterhorn Gotthard Bahn (MGB), following a merger between the BVZ and the Furka Oberalp Bahn (FO). Täsch railway station is a metre gauge railway station serving the municipality of Täsch, in the Canton of Valais, Switzerland. It forms part of the Brig-Visp-Zermatt railway (BVZ), which connects the car-free mountaineering and ski resort of Zermatt with standard gauge lines at Visp and Brig. Testa Grigia is a rocky prominence above the Theodul Pass, located on the border between Italy and Switzerland (Valais). The Gandegg Hut is an alpine hut, located above Zermatt in the canton of Valais. It is located at a height of 3,029 metres above sea level, near Trockener Steg, approximately halfway between the Matterhorn and the Breithorn. The Theodul Glacier is a glacier of the Alps, located south of Zermatt in the canton of Valais. It lies on the Swiss side of the Pennine Alps, although its upper basin touches the Italian region of the Aosta Valley. The glacier descends from the west side of the Breithorn and splits into two diverging branches above Gandegg: the Upper Theodul Glacier, spilling on a high plateau near Trockener Steg, together with the Furgg Glacier, and the Lower Theodul Glacier, reaching a height of about 2,500 metres (8,202 ft) above the Gorner Glacier. 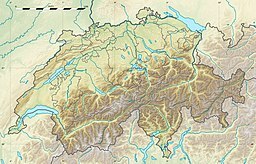 Both branches are part of the Rhone basin, through the rivers Gornera, Mattervispa, and Vispa. Slightly above the glacier splitting is the Theodul Pass, crossing the border between Switzerland and Italy, and connecting Zermatt to Breuil-Cervinia. On the west, the Theodul Glacier is overlooked by the Matterhorn.